Well, mostly because the city of Albany provides trash pick-up and recycling at no additional cost to homeowners. In the suburbs, most folks pay for trash pick-up, but in Albany, it's free. Well, sort of -- the cost is figured into municipal taxes. In addition to their trash and recycling pick-up, Albanians are provided with recycling bins for paper, cardboard, cans, glass, and plastics -- all plastics (1-7). That's a huge bonus -- not all municipalities recycle all plastics. Albany is a trashy town. To be fair, our whole region is -- but that's largely our own fault. To say the Albany's landfill issues are a contentious topic would be a major understatement. Trash is a major revenue source for the city of Albany, but it's an unsustainable one. According to Albany's comprehensive plan, the city-owned landfill is expected to be at capacity by 2016. That's not a lot of time for the Capital Region Recycling Partnership, the committee made up of reps from Albany and 14 other Capital Region municipalities, to improve their waste reduction and sustainability plans. So I'm suggesting a new approach: charge for trash pick-up, but keep recycling pick-up free. In addition, I'd like to see the city explore a fee-based lawn and food waste compost program to help reduce landfill methane (a damaging greenhouse gas). This would encourage residents to begin home composting. Charging for trash pick-up may be the catalyst for residents to become more cognizant of what they're throwing out, while helping to reduce waste bound for the landfill. According to the comprehensive plan, 42 percent of the city's waste is currently diverted from the landfill through recycling and composting. The goal is to increase that to 65 percent by 2030 (Albany 2030, 170-173). Fee-based trash pick-up is also listed as an action item in the solid waste management section of the plan. Implementing this idea would certainly help the city achieve its stated goal. With an estimated population of 612,100 in 2011 (Seattle.gov), Seattle is a larger city that has implemented measures to reduce solid waste through the use of city-issued trash bins. A monthly fee is applied depending on the size of the trash bin and recycling bins are provided at no cost. The more you recycle, the smaller your trash bin and, subsequently, the smaller your rate will be (Seattle Public Utilities). Closer to home, Ithaca and Tompkins County charge for trash pick-up through a combination of an annual fee and trash tags that can be purchased from the city or at the grocery store (in 2008 it was $54/year for a single family residence) (Tompkins County Recycling and Solid Waste). Recycling is coordinated through the county and residents are charged for the recycling bin. Some may argue that this is a proposal for yet another government-mandated action and another way that our personal freedoms are being infringed upon. I say get over it. More often than not, when left to our own devices, we're incapable, as a society, of improving our world. We often let our needs or desires outweigh the greater good. And in this situation, we're quickly approaching the finish line -- but with no winner. By incentivizing recycling, Albany can use this situation to set itself up for long term improvement. And make the world a bit better. That would be a victory. Elisabeth lives in Albany with her husband, daughter, and Bernese Mountain Dog, Ruby. the towns of Berne, Bethlehem, Guilderland, Knox, New Scotland (including the Villiage of Voorheesville) and Westerlo, the villages of Green Island and Altamont. Most of these municipalities don't offer recycling, and if they do it is not as comprehensive as Albany's program. Albany offers a lot of fantastic programs and services that enhance the lives of us all, but doing so by selling landfill space is shortsighted, especially since we landfill many items from other towns that could be recycled. I'd also like to see some kind of dump program, where old appliances, furniture, etc are collected and residents have the option of coming in and picking items for scrap or use. In the summer this often happens on it's own. You're preaching to the choir here. I recycle everything, it's not difficult. Basically we need to make recycling a financial positive to induce a change in behavior. In addition, since many will simply pay more to remain slobs, fine those who choose to not recycle. There's no such thing as personal liberty when the actions of one affects all of us. Citywide composting of food waste would help immensely. I thought that if the city recognized recycling items in the garbage they were not supposed to pick up the garbage....Maybe I'm wrong, but that would be one way of getting people to recycle too. I think education is the biggest issue on this front though. My current landlord tried t tell me that people don't recycle here! I told her she was very mistaken. If the landlord doesn't provide recycling bins some people think it is a special service or something, or don't recognize they can order them themselves (they can be ordered FOR FREE and picked up through DGS (or is it OGS, I can never get those two straight) on Broadway). Seems to me that landlords should be required to provide them. 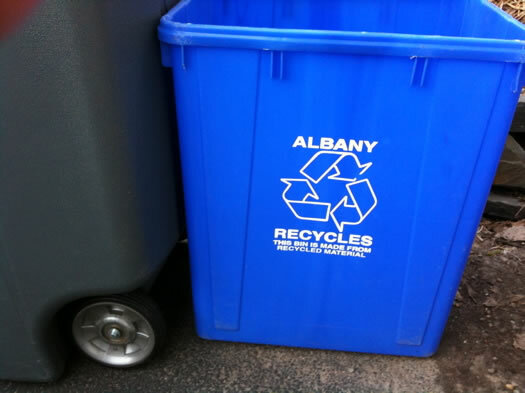 How does recycling in Albany work now? Are there separate bins for paper, glass, etc., or is it single-stream (everything in one bin)? We have County Waste in Waterford and there are two bins: a big stand-up wheely-type bin for the garbage and an identical (except for the color) wheely bin for single-stream recycling. Also, garbage pickup is included in the taxes here. I don't want to start a fight, but given that taxes are a frequent complaint in the endless cities-vs-suburbs debate, are we sure we want to tack on an extra fee for garbage collection? Cynicism-tinged common sense states that the city wouldn't cut taxes if waste removal was no longer part of the "complete package", so forcing residents to pay extra to have their trash hauled away on top of their already-high taxes would appear to be another example of the nickel-and-diming that the anti-urban crowd claims goes on in the cities. All told, though, I agree that something should be done to encourage greater recycling compliance. Aside from adopting single-stream recycling, though, I'm not sure what that "something" could be. I just recently moved here from Louisiana. New Orleans and I have to say that the trash pickup here is abysmal. We paid a monthly fee on our water bill for trash collection. Every house in the Greater New Orleans that paid this fee would be able to get a free 96 gallon trash can on wheels for trash. Which is huge, on top of that trash was collected twice a week and disposing of large items was easy. Along with a 32 gallon can with wheels was provided free of charge for recycling, also free of charge. Here in Albany trash is collected once a week, with a 50 gallon limit on the trash can AND you have to buy it yourself. Alongside this are limitations on boxes and number of bags you can put outside of the trashcan. Now this is all free and such but I would gladly pay to have twice a week trash pickup and no limitation on number of bags. You may say "Well why do you have so much trash." In a normal week I don't, but since I just moved in I've had an enormous number of boxes and debris to throw away that doesnt exactly fit inside the tiny little blue box you use for recycling. Some weeks I may have guests or parties in which I cook or consume more food and trash than usual. Now I bring this up because trash collection is free here and although claiming that having residents pay for trash collection is the ideal thing to make people more willing to recycle is probably incorrect as if you want to look up, New Orleans is rated the number 1 dirtiest city in the nation. Now this is also because that city has a huge bar scene, lots of tourists, and Mardi Gras, which is probably one of the dirtiest scenes you could ever witness in a city in the US. But the point is that we paid for trash pickup and recycling was free and still there was not that much recycling by the people going on in the city. Even though I sound like I might be disagreeing with you, I am not. I believe that charging for trash collection is a way for revenue to flow for the city and for trash collection to improve. As I find this cities trash collection pretty poor and it probably goes hand in hand with the fact that trash collection is free of charge. Former Seattle resident here. In Seattle I had a 20-gallon garbage can ($21/mo), a 32-gallon food waste bin ($7/mo), and a honkin' 64-gallon single-stream recycling bin (free). Larger garbage cans went up at about the rate of $1/gallon/month. Got a big party/move and you need to put out more trash one week? Fine. It's an extra $8/32 gallon can that week (you supply the extra cans, but the city supplies all the other waste containers). Three adults lived in one single-family house and we managed incredibly well with that set-up. We were not dainty consumers either. We cooked big meals daily, etc. When family from out of state would see the tiny volume of our garbage can they would scoff, wondering how it was possible. Then again, those were the weeks that the garbage can would overflow, because they didn't know/care what could be recycled/composted. With this pay structure in place, the amount of waste in Seattle has gone down - WAY down - and recycling is way up. But it took a very proactive campaign to educate people about what can/cannot be recycled and composted, a heavy hand from the city in the form of fees, and a bunch of raging liberals wiling to spend extra energy putting things in the right place. Is that in the cards for Albany? I just don't know. Also, maybe someone knows this: I was told that for large apartment buildings (>4 units), Albany does not pick up their garbage and they have to make other arrangements. Any truth to this rumor? We live on the commecial side of a street in Albany. They will not pick up our trash, the same applies to appartment house bigger than 2 units. Our taxes are very high, as is crime rate here, our basement floods when there is a big rain, AHS student flunk out of school in their senior year here, the sidewalks , and roads are bad, except around ST. ROSE ( imagine that), students, and their bars RULE! And you want my neighbors to pay for trash pick up! You do not sound like the 99%! This article is very elitist, maybe she alone should pay! Let ALBANY give residents one nice thing, for goodness sake! In Providence, RI to avoid that sort of happening, they recently instituted a policy where trash would not be picked up if there were no recycling bins out along with the trash. It was annoying, because if I had been away and not produced much recycling but wanted to say, throw away the bathroom garbage, I had to drag the recycling bins to the curb anyway, but it definitely encouraged folks to recycle more. If you didn't have a recycling bin out they just left your garbage at the curb. Compared to other areas, I think Albany has a really great system going already, but getting people to pay for trash pick up would be rough. If they tried for one of those monthly fee cans, how likely is it that the college rental places downtown are going to comply? If you drive down Western near St. Rose on garbage night, it's one long line of garbage unceremoniously dumped on the curb. If they had bins, I can't see them being used (unless the landlords found a way to encourage/enforce it). In my neighborhood, probably 95% of the people recycle (like you said, it's hard to miss when you walk dogs). I have one neighbor who has the tiniest garbage can I've ever seen, it can't be more than a foot tall. They put that out with one or two recycle bins each week - it's impressive and I'd love to be at that point some day. I pay in Bethlehem for trash and recycling collection, we recycle every number all single stream and it's very easy. If I have a ton of boxes for some reason or something really large it's a 5 minute drive to the big recycling dropoff at Elm Ave & 32. I'd like a financial incentive (or maybe a cookie) in exchange for recycling (or composting), but I'll keep on keepin' on without it. I agree it may help others who are on the fence about recycling (??? why???) get started. It's hard not to recycle; you can toss almost everything in those bins now. I love it! It would be easy to judge and say that not to do so is pure laziness, but I have to remind myself that not everyone is used to it yet. When people visit my house, I will find soda bottles and beer cans in my trash. I take them out when I can, but I always thought it was a little strange that people didn't at least ask if I recycled. The only downside is that we only have one bin for our building, and the garbage cans and recycling bin are right outside my front door. I'm pretty sure I'm the only person that uses the bin, as I only need to toss things out of my door, whereas the other tenants need to go a bit further. That being said, when I lived in another building and I was on the second floor, I would save up my recyclables in a shopping bag and throw them in the bin all at once, so I don't see why they don't just do that. *shrug* I guess it's just not as important to some people. mg, that is odd, since most apartment buildings in my neighborhood are 3-4 units (or more) and my trash is picked up fine. I also used to have your problem with my trash being near a commercial business (I used to live above a restaurant), so we had to walk further down the street with it. Have you tried calling OGS about the trash problem? Maybe it's just a careless oversight and speaking up to the right people will help. I heard that before trash pick-up was free here, many people wouldn't/couldn't pay or haul their garbage to the dump, so backyards and sidewalks became makeshift dumps, and it was awful. The rule in this city, otherwise known as DODGE CITY ( because of all the shootings) is no pick up in front of commercial buildings! St. Rose is getting new pavement for the street, and they din't even need it! "There's no such thing as personal liberty when the actions of one affects all of us. " That is a scary notion, but one way too prevalent in America now. If you harm others it is different, not recycling is not killing anyone. - To Josalyn - On the contrary, if you bag up your recycling and it "looks" like trash (even though it's in the damn bin), then DGS treats it like garbage. My mother learned this the hard way after her first garbage pickup after moving into her new house. No bagging allowed, apparently. - MG, Elisabeth, et. al. - I would like to see the city make it easier for those of us who live in apartments to recycle. My building is more than 4 units but relatively small, so my landlord has only garbage removal, not recycling. The closest place we can go to bring our recycling to a transfer station? COLUMBIA COUNTY. For serious. (If there's a closer one I am unaware of that will accept non-residents, please, enlighten me.) It's really obnoxious, because my husband and I DO recycle, even if it means amassing clutter until we can make it to the transfer station. It would be nice if they allowed city residents to bring their recycling to the transfer station as well. Albany should do what NYC and other cities do: Make recycling mandatory, and fine people who don't comply. It would easier and more fair than requiring everyone to pay for trash pickup. Something isn't right. There is absolutely NO way that you cannot have your garbage picked up. It's a health issue. If your building is more than 3 units the landlord has to pay for non-city pick up of your garbage. I assume you are not the landlord. Otherwise the city MUST pick up your garbage. You should definitely call OGS and get that sorted out, they may not recognize there are apartments above the commercial property. 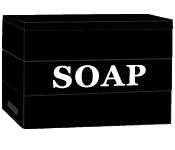 Homeowners pay taxes that along with land and water includes garbage service. The basement flooding is not the city's fault unless there is a water main break, again, the landlord should take care of that. It sounds like you live in the student ghetto. The fixing of the roads around St. Rose is because of all the construction they are doing, and I'm guessing they may be paying, at least in part for the roads to be re-done around the school since the equipment they are hiring for the construction is likely impacting the roads a lot. Was happy to see your article regarding trash. It is so unfortunate to see how disinterested people are regarding recycling in certain neighborhoods in the City of Albany. As well, people not using trash bins when the City has done everything possible to place them just about everywhere and then empties them almost daily! But, on a hopeful note, the Washington Sq. Neighborhood Association had a presentation by DGS Directo of Recycling, Frank Zeoli, the next step will be to put greater pressure on property owners to require recycling. Possibly even fines if they do not comply. This is long past due as the landfill fills up. Thanks again!